Taste test: If you've been suckered into trying the low-carb lifestyle as a way to lose weight (eat less and exercise more! ), then you deserve to be fooled into thinking that these snacks will help you attain that lifestyle. Like low-fat snacks before it, these low-carb chips try to replicate the taste of Doritos while taking out the carbohydrates. I guess they used soy to achieve this (it's on the bag description). The taste, however, is awful. The chips are less crunchy than the normal Doritos, and it leaves a very odd, gritty aftertaste in your mouth, as if the chips crumble in your mouth. 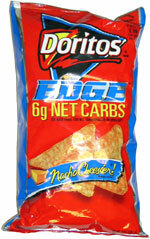 We had about three of these chips before running to the water bottle to wash our mouth out. If you wanted, you could just lick the nacho cheese powder off the chip and then discard it, but we think that's kind of weird. Smell test: They don't smell like regular Doritos, that's for sure. Kind of a dry, cheesy smell. This snack was discovered by Keith at Old Colony Market, Southborough, Massachusetts. Review published .